Above: The Plurabelle Paddlers get into action at the Dragon Boat Regatta on Saturday September 12th. Down on Hanover Quay on a beautiful sunny Wednesday evening NewsFour spied a sight straight out of the Last of the Mohicans – what looked like a 40-foot kayak being rowed towards us by 20 Amazons! The boats were spectacular. No ordinary kayaks, these boats are veritable serpents, Dragon Boats with an elaborately decorated head and tail at prow and stern. It turns out Hanover Quay is home to a very special group of ladies, the Plurabelle Paddlers. The team members all have three thing in common: they train hard, they have fun, and they have all been diagnosed with breast cancer. They are survivors one and all, and they support each other. NewsFour met Margaret Mulcahy, a Paddler since the club’s founding in 2010. She was on helm, steering the boat and leading the crew. Like all the belles, Margaret is very friendly and gave me a warm welcome and was very helpful and informative. Margaret was helping to train some novice crew members in the Livia while Rosemary Welsh, the fittest athlete in the club and a true inspiration to all, helmed the Anna with an experienced crew. The veteran crew were very impressive indeed. 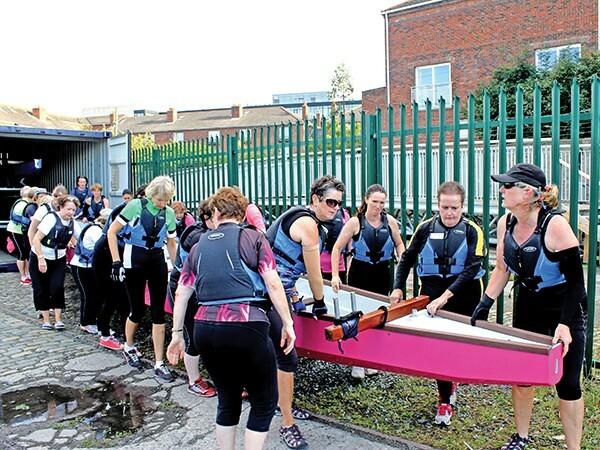 The Plurabelle Paddlers are blessed with a plethora of natural leaders such as Margaret and Rose, experienced paddlers who take on the responsibility of leading a crew, and Dympna Watson, who was like an army officer expertly directing her crew to take the boats out of storage and launch them in the Grand Canal Dock. Like all the best leaders, she leads by example and communicates clearly and concisely. Not to forget Marian O’Dea, who epitomises leadership from the front. Dragon boating is an ancient Chinese sport that dates back over 2,000 years. The dragon boat itself is deeply imbedded in China’s dragon culture, with each boat having an ornately carved dragon’s head at the bow and a tail in the stern. The boat is painted with scales and the paddles symbolically represent the dragon’s claws. Competing teams paddle their boats forward to a drumbeat, racing to reach the finish first. The dragon boat festival is celebrated every year on the fifth day of the fifth month of the Chinese lunar calendar. The boat races during the Dragon Boat Festival originate from the attempts to rescue the legendary Chinese poet Chu Yuan, who drowned on the fifth day of the fifth lunar month in 277 B.C. Modern day dragon boating has evolved as a high performance sport, capturing the imagination of the world by storm. With over 50 million paddlers participating annually in competitions worldwide, it is the fastest growing water sport in the world. Our local Plurabelle Paddlers have competed all over the world from Florida to Malaysia. Dragon boating is not only competitive; it is sociable, fun, colourful and dynamic. Dragon boating was originally introduced to Ireland in the early 1990s when boats were brought from the UK to hold events. The Irish Dragon Boat Association (IDBA) is the National Governing Body of the sport of dragon boat racing in Ireland. The IDBA is responsible for all aspects of the sport from community development through to managing Irish teams racing abroad. The Plurabelle Paddlers were set-up in 2010 by Marian O’Dea and the late and lamented Fiona Tiernan. After the public announcement of their intention to start a Dragon Boat club for survivors of Breast Cancer over 100 ladies turned up to join. It was a startlingly good show of support and the club continues to have a large and active membership today. Pictured Above: The Plurabelle Paddlers in action. One of the challenges that faces many Breast Cancer survivors is Lymphoedema, a long-term condition without a known cure. It can usually be well controlled with early treatment. A common cause is advanced cancer causing a blockage in the lymphatic system, an important part of the immune system. The rationale behind setting-up the club ultimately came from Dr. Don McKenzie, a sports medicine physician at the University of British Columbia, Canada. Dr McKenzie believed that by following a special exercise and Dragon Boat training program, people could avoid Lymphoedema and enjoy active, full lives. This inspired the first breast cancer dragon boat team, Abreast in a Boat, and the sport has now grown to over 150 breast cancer teams worldwide. The Plurabelle Paddlers is the first such team in Ireland. The paddlers are always welcoming to new members. If you are looking to get fit after treatment from breast cancer, and make some new supportive friends too; if you would like to become involved in an energetic and fun team sport, the Plurabelle Paddlers would love to hear from you. You can call them on 087 468 6662 or email: newmembers@plurabellepaddlers.com. The belles train on the water twice a week from March to November on Wednesday evenings and Saturday mornings. Members’ ages range from their early 30s to 70+. They have two wonderful German-built boats. Livia is pink and was sponsored by Breast Cancer Ireland. Anna is navy and was sponsored by the Health Service Executive (HSE). They also have a fine clubhouse and indoor gym on Hanover Quay. The belles are coached by Julie Doyle, who very generously devotes much of her spare time to commuting from Carlow twice a week to train the ladies. Julie and her husband are experts in Dragon Boat racing, and Julie previously represented Great Britain in races. 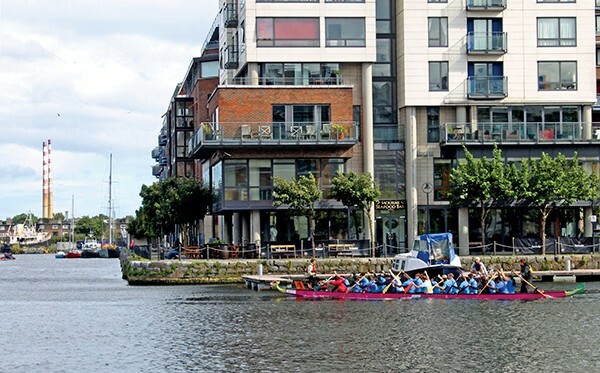 The belles paddle every year in the Dublin Dragon Boat Regatta, which this year was held on Saturday 12th and Sunday 13th September at the Grand Canal Dock, Ringsend, Dublin 4.